The Alvin Sherman Library and the College of Arts, Humanities and Social Sciences will sponsor an Irish Film Festival that allows a South Florida audience to see independent contemporary Irish films not widely released in the U.S. The Festival was the brainchild of Professor David Kilroy, a native of Ireland and a faculty member in the College of Arts, Humanities and Sciences. Working with the Irish Film Institute in Dublin, Professor Kilroy has been able to secure a wide array of films over the years, from cutting edge dramas to hard-nosed documentaries, representing the work of some of Ireland’s most exciting filmmakers. This year’s lineup includes two documentaries and one feature length film. 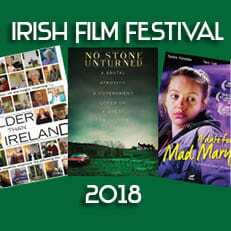 The festival opens on November 5, 2018 with an award winning documentary Older Than Ireland. The documentary explores what it means to have lived 100 years, and more, in Ireland. Director’s Choice Award, Boston Irish Film Festival, 2016. Best New Irish Documentary, Galway Film Fleadh, 2015. The Irish Film Festival is co-sponsored by the South Florida Irish Studies Consortium. It is free and open to the public. For more information, contact David Kilroy at dkilroy@nova.edu or Kimberli Kidd at kkidd@nova.edu. To RSVP, visit lib.nova.edu/irishfilms. All films can be viewed in the Alvin Sherman Library, Conference Room 2053. Featuring 30 men and women, all born before 1916, Older Than Ireland is something of a landmark documentary that explores what it means to have lived 100 years, and more, in Ireland. No Stone Unturned explores the 1994 Loughinisland Massacre in which six Catholic men were shot in a bar as they watched Ireland play in the World Cup. Film director Alex Gibney pursues the story of an alleged cover-up and collusion at the highest level of British police and governmental authority. Joint winner of Best Irish Feature at the 2016 Galway Film Fleadh, A Date for Mad Mary centers on the exceptional performance by lead actress Seana Kerslake. Upon release following a six month prison sentence, Mary returns home to Drogheda, eager to reunite with best friend Charlene, for whom she is about to act as a maid of honor. Annoyed by Charlene’s assumption that she won’t have a date for the wedding, Mary joins a dating agency, embarking on a series of disastrous encounters before events take an unexpected turn.